If you find yourself in any of these categories, this post was written for you. Do you really know what Pinterest is? Take a few minutes to read this post. It’s a good introduction to what Pinterest is all about. 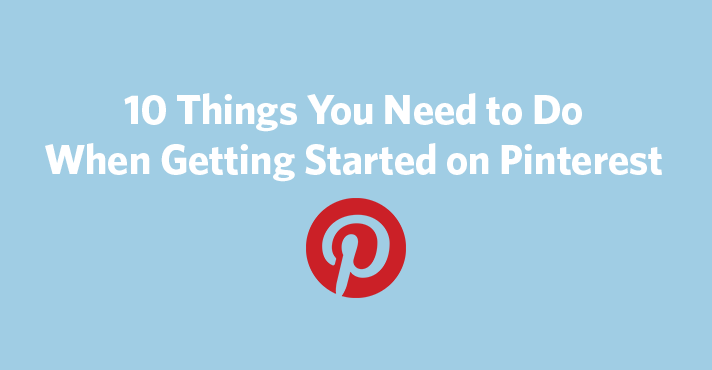 Do you know why you’re getting started on Pinterest? You should always have some goal in mind when getting started on any social network. I’m not saying you need to have reports with projections for future growth, but you should at least have an answer when someone asks you why you’re signing up. Do you know how to get around on Pinterest? It’s a good idea—before you start using Pinterest to market your business—to create a personal profile to help learn the ropes. Get familiar with the language (pin, repin, boards, etc.) 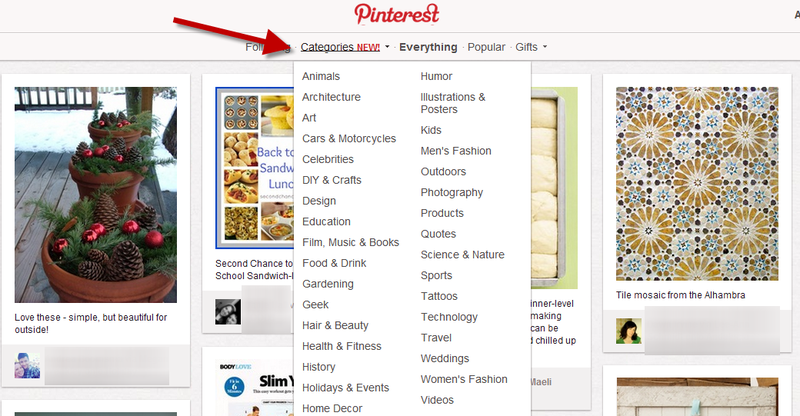 and explore the different pages and features that Pinterest offers. On Pinterest, there are two names you need to be aware of: your username and your account name. 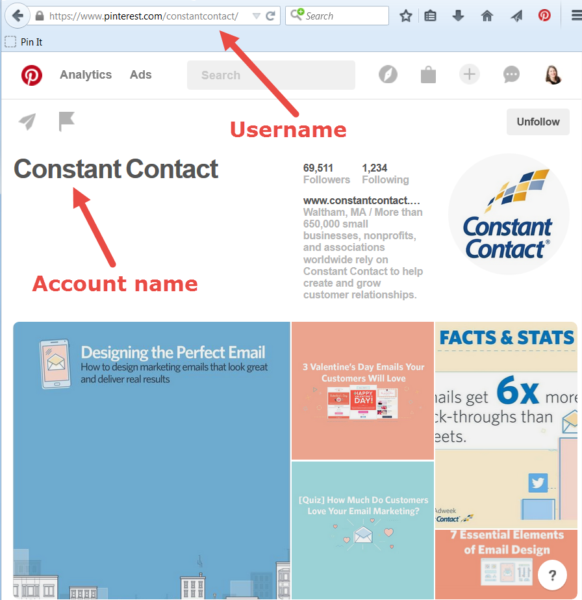 Your username is the name that will be used in the URL of your Pinterest page (www.pinterest.com/username), but will not be the name that is displayed on your profile. The name that will be displayed on your Pinterest page (and will be the name that people use to search for you on Pinterest) is your account name. So if you’re setting up a page for your business, start by visiting the Pinterest for Business website and clicking the “Join as a business” button. Create your account by filling in your business name and username in the signup process. The ByPage logo makes the perfect profile picture. It fits the dimensions, it stands out on a white background, and it catches the attention of their followers. The focus of Pinterest as a site for content curation—where people are constantly looking to find content they love and want to share—makes it a place where a lot of new people are going to be exposed to your business. You’re a bakery and you pin a picture of a fresh batch of muffins. My friend, who’s already a customer and follows your “Muffins” board, sees the picture … LOVES IT! and repins it to her “Muffin Madness” board. So who are you? Tell me, or any customer: who you are, what you do, and why I should want to follow you or your boards. Guess what? You’re not the only business that’s in the beginner stages of Pinterest. In fact, with a lifespan of just over two years, the vast majority of Pinterest users would probably tell you they still have more to learn. For that reason, and because Pinterest in its very nature is a site based on collaboration—you shouldn’t be afraid to look to other businesses for help when you’re getting started. Reach out to other local businesses, search for bigger businesses in your industry, ask your customers, or click on Pinterest’s “discover” icon to explore categories and trends to find inspiration. Like with anything else, if you don’t have the right tools for the job—it’s tough to be successful. Lucky for you, there are a couple of free tools you can access right from day one that will improve your chances of success on Pinterest. Install the pin it button to your browser: Pinterest offers a free integration with all online browsers that will let you pin content to your page directly from any website. The “pin it” button not only makes it easy for you to curate content, but it will also link that content directly to the website it’s sourced from, helping you avoid any possible problems. Download the Pinterest app: If you’re an iPhone or Android user, the Pinterest app lets you manage your page on-the-go, directly from your phone. Use Pinterest’s built-in analytics tool: You can find Pinterest’s analytics features by going to analytics.pinterest.com, or by clicking on the Analytics link in the top of your profile.This tool tracks the growth of your profile, who is engaging with your pins, and what people are pinning from your website. Check your analytics on a regular basis to get a sense of what pins people are most interested in. Believe it or not, you’re now ready to start creating your own boards. I recommend creating at least three boards with a few pins on each, before you really start promoting your page. You don’t want to tell people you’re on Pinterest, until you’re actually on Pinterest. 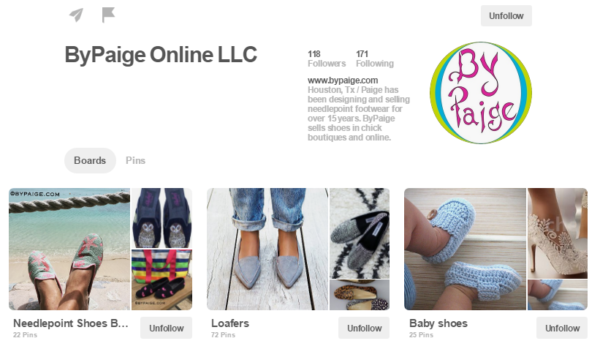 A board about your products or services: This board can be a great way to start contributing to the Pinterest community and to showcase your business. Be careful not to be too promotional, even when you’re just starting off. Make sure to give your board a better name than “Services” (maybe try… “What We Do”) and make sure your pins all have descriptions and link to your website. A board designed to help: A key to not being too promotional on Pinterest is creating boards that your customers can actually use. If you’re a clothing store or boutique, that could be a board about fashion tips for the upcoming season, or if you’re a marketing company, that could be a board with infographics or pictures that link to blog posts—anything that will showcase your expertise and get people involved. A board that’s just fun: I know getting started can be a little stressful, but try to lighten up. The beauty of Pinterest is that you can showcase your business and have fun while you do it. Think of something you love and that your customers will find entertaining. Don’t be afraid to think outside the box. Creating boards with creative themes and unique goals is a good way to avoid being overly promotional on Pinterest. When you’re creating your boards and pins, be strategic about the words you use in the board titles and pin descriptions. Many people use Pinterest as a visual search engine to find the products or topics they’re interested in, so make sure your boards and pins show up in search results related to the keywords you use. For example, a board of seasonal treats called “Fall Favorites” won’t be as visible in a search as a board called “Best Fall Dessert Recipes.” Take the keywords you’re using on your website, and in your email marketing, and social media marketing, and apply them to your Pinterest content. Pinterest users LOVE finding out that their favorite business or organization is on Pinterest. Use the networks that you already have to spread the word. You can use Facebook and Twitter to tell people to find you on Pinterest. If someone has already joined your email list, they most likely would love to connect with you on Pinterest too. Send out an email to your contact list, inviting people to follow your boards or business. 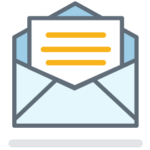 It’s easy to do with Constant Contact’s email templates. Pinners are shoppers. In fact, 89% of Pinterest users have bought something they found on Pinterest. So let them know that your business is there by linking to your Pinterest account on your website. Not connecting your website to your social networks is a bad practice for all social networks, but especially for Pinterest. Adding a Pinterest logo to your website will not only help drive traffic to your page, but will act as a reminder to people who visit your website to pin your content. You’ll also want to make sure you’re inserting a link in your email newsletter with a strong call to action. You’ve set up your profile, you’ve created a foundation, and you’ve begun spreading the word—don’t stop there! Continue to explore and find new and creative ways to market your business on Pinterest. It won’t be long before you’re the one that other businesses look to for advice on getting started. For more tips on Pinterest and other social media marketing tools, sign up to receive our Hints & Tips newsletter.